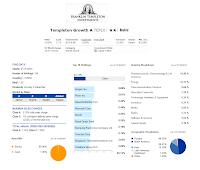 This Templeton Growth Fund is managed by a team of portfolio managers consist of Lisa F. Myers (since 2003), Tucker Scott (since 2007), Matthew R (since 2010), James Harper (since 2010) and Norm J. Boersma (since 2011). This stock fund dividend yield is 1.68%.This yield is distributed on yearly basis. Last year (2010), the fund distributed $0.37 dividend for its investors. The annual holdings turnover of this fund is 1.08%. Morningstar gave this fund 2-star rating. Since its inception, this Franklin Templeton fund has recorded in 45 years with positive return and 11 years with negative return. Among the 45 years, the best performance was in year 2003 with 32.85%. The benchmarks of this fund are MSCI World Index and S&P 500 Index. Based on the load adjusted return, this TEPLX fund has returned -3.66% over the past year and 3.14% over the past decade. If you are interested to buy this mutual fund, please note that there is a 12b1 fee of 0.25% and front-end sales load fee of 5.75%. The minimum initial investment for brokerage account is $1,000. For IRA account is $250. There is no minimum subsequent investment. This TEPLX fund has total net assets of $14.85 billion. This fund is available for purchase through 119 brokerages, such as Edward Jones, Merrill Lynch, JPMorgan, Schwab Retail, Raymond James, Royal Alliance, Principal Advantage, Bear Stearns Load, etc. 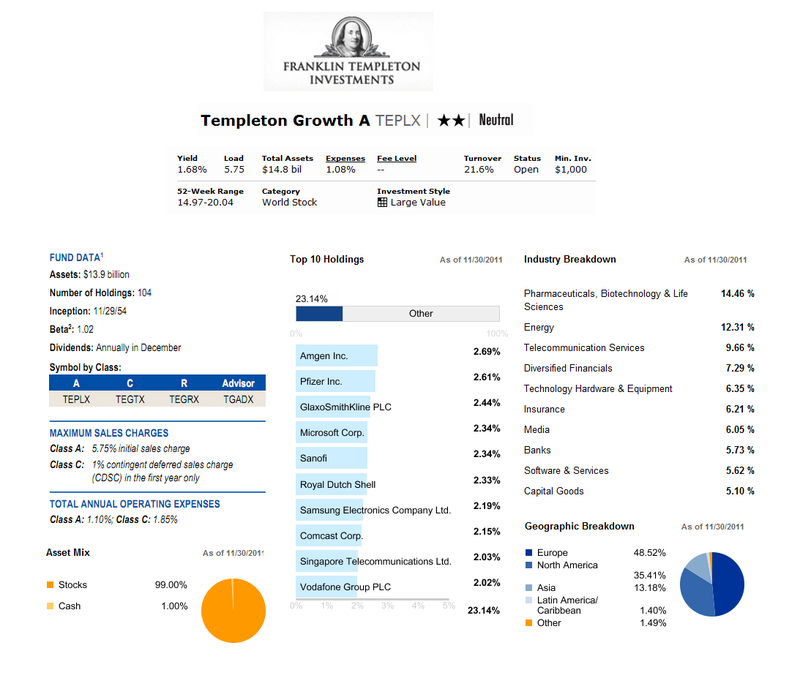 Besides TEPLX (Class A), the other classes of this Templeton Growth Fund are TMGBX (Class B), TEGTX (Class C), TEGRX (Class R) and TGADX (Class Advisor). The top 10 holdings of this fund as of November 31, 2011 are Amgen Inc (2.69%), Pfizer Inc (2.61%), Glaxo Smite Kline PLC (2.44%), Microsoft Corp (2.34%), Sanofi (2.34%), Royal Dutch Shell (2.33%), Samsung Electronics Company Ltd (2.19%), Comcast Corp (2.15%), Singapore Telecommunications Ltd (2.03%) and Vodafone Group PLC (2.02%). These ten companies represent 23.14% of the total assets. The top 5 industry breakdowns are Pharmaceuticals, Biotechnology & Life Sciences (14.46%) and Energy (12.31%). Investment in this world stock fund involves Risks such as Market Risk, Foreign Securities Risk, Value Style Investing Risk, Management Risk, Currency Risk, and Focus Risk.